June 8, 2017 — Links International Journal of Socialist Renewal reposted from Review of African Political Economy — South Africa is at crossroads, facing its biggest upheavals since independence in 1994. Globally, since the 2008 Great Recession there are growing explosive class and social conflicts due to the deepening crisis of capitalism. Economic apartheid remains a stark reality today. According to OXFAM South Africa is the most unequal country in the world where a 10 per cent minority, largely white, controls 65% of the wealth, 3 white male billionaires own as much wealth as half the population, 28 million people. Blacks control only 3% of companies listed on the JSE. Over 85% of the land is owned by 20000 white farmers, or 0.03% of the population. Whilst only 4.1% of white workers earn less than the living wage of R6880, about 71% of blacks earn less than this with over 50% of black youths unemployed. According to Forbes Index, one third of Africa’s richest billionaires live in South Africa. A few blacks have been co-opted like Cyril Ramaphosa, the former trade union leader, who is worth an estimated $450million. So, the worsening poverty, an unreformed Apartheid economy, a global neoliberal offensive and the escalating revolt of the poor is the central issue in South Africa today. It is in this context that we have to view the rapid rise of Julius Malema’s Economic Freedom Fighters (EFF), articulating such anger, even if opportunistically and increasingly erratically. The ruling classes are tearing each other part. The traditional wing sees the solution as increasing the neoliberal austerity offensive against the working classes. But a growing minority is calling for a partial retreat from the neoliberal policies towards economic nationalism. We saw this with Robert Mugabe in Zimbabwe after 1997. Desperate after losing key towns in the 2016 local authority elections, Zuma is attempting the same with a threatened radical economic transformation. In early April he dismissed Finance Minister Pravin Gordhan, who was supported by big white capitalists. This has touched off the Zuma Must Fall protests of tens of thousands by the opposition, supported by some of South Africa’s biggest capitalists. This blogpost considers the way forward and argues that the popular classes must not repeat the mistake of the Zimbabwean working class whose uprisings in 1997-2002 were eventually co-opted by their class enemies. I look briefly at the experience of Zimbabwe from the late 1990s, then examine in detail the situation in South Africa. What can South Africa’s popular movements learn from their northern neighbour? This was not an exaggeration. Between 1996 and 1998 Zimbabwe saw national public-private sector strikes, the first general strike since 1948, a shutdown of the national university in the capital, and a nationwide student revolt—which politicized war veterans. Ex-fighters from the 1970s liberation war supported by poor peasants seized farmland in a widening arch of protest that challenged the ruling party’s power. Yet the opposition became increasingly cautious, facing repression that claimed the lives of hundreds of activists. The MDC moved right. As the party grew in influence it attracted a markedly mixed crowd of supporters. Unreconstructed “Rhodesians”—remnants of the white settlers, who had kept their land and farms after independence—business owners, and the Zimbabwean 1 percent, all disillusioned by ZANU-PF, which they had supported for years, flocked to the new party. ZANU-PF saw its opportunity. It started to champion the war veterans and encourage their occupation of white farms after it was defeated in a referendum in 2000. ZANU-PF became the representatives of land-poor Zimbabweans. In simultaneously bizarre and disheartening circumstances, the MDC— now under the influence of white interests, business owners, and the middle class— promised to return the farms to white landholders in the interest of “legality.” ZANU-PF outflanked the MDC from the left and presented itself as a party of a radical African renaissance. 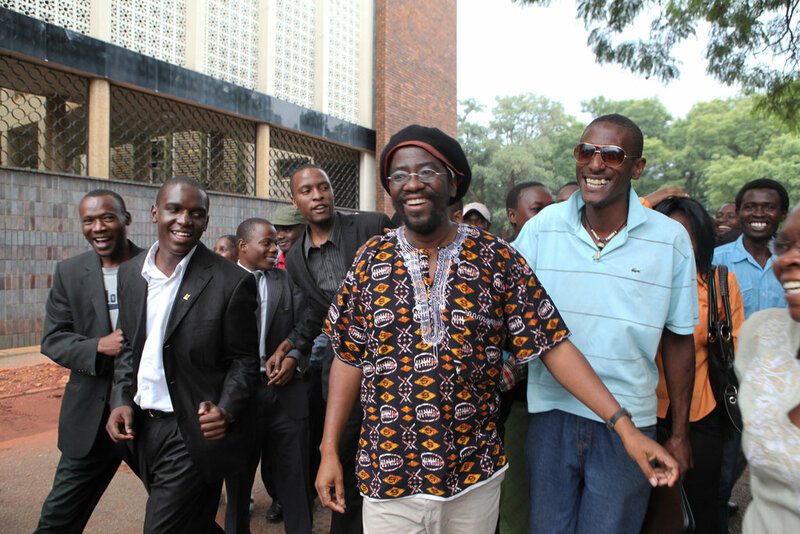 Zimbabwe, the party said, was undergoing its third Chimurenga (uprising). Having briefly inspired the struggle against the ZANU-PF state—the high point of popular resistance across the continent—the opposition entered a protracted period of meltdown. It fractured into different groups led by various politicians and NGOs, which funneled activists in other directions. Ultimately the political opposition, now operating in non-profits or mobilized by contaminated political parties, disarmed the movement from below and shifted the public’s attention from the actual struggle to other arenas—paid workshops, foreign scholarships, and political stunts. What is happening in South Africa, and how can its radical movements and parties learn from Zimbabwe? The radical socialist trade union, NUMSA, is correct to point out that both elements of the capitalist class, those pushing for further and deeper neoliberalism, and those wanting a partial retreat, are the enemies of the working classes and should not be supported. But the working classes must strategically intervene in the unfolding struggles and debates, to take advantage of the splits amongst our rulers and push a radical agenda. The popular classes should strategically support the call for radical economic transformation, even if called by a corrupt and desperate Zuma. Yet they must not join the opposition-led and big capital supported Zuma Must Fall marches and instead accelerate the struggles for the immediate implementation of anti-neoliberal and pro-poor policies to end the apartheid economy. Such a radical reformist narrative goes to the root of the unfinished business of 1994, where the ANC –SACP (South African Communist Party) elites, in return for a few crumbs, betrayed the Freedom Charter demand of nationalization of the mines, banks and redistribution of land. Instead they agreed to a rotten deal which ended political Apartheid but left the economy in the hands of a tiny elite of white and international capitalists who grow fatter on the super-exploitation of the black working classes. The Zuma Must Fall campaign seeks to change the central narrative in society, from the rising struggles against the unreformed Apartheid economy, to that of Zuma’s corruption. While important, this is not the central issue, instead it seeks to disguise, co-opt and neutralize the rising struggles. Joining the Zuma Must Fall campaigns, as done by ex-COSATU General Secretary Zwelinzima Vavi and much of the left, is very dangerous. The forces that have coalesced around these campaigns are huge, with the biggest war chest of any movement on this continent, desperate to avoid another ‘Zimbabwe situation’ in South Africa. Comparison with what the left did in Zimbabwe in 1997- 2002, joining the MDC, is wrong. Zimbabwe is a highly authoritarian regime, unlike South Africa which has the most advanced bourgeois democracy in Africa. The left was tiny in Zimbabwe. Yet as we have seen there was a rising working class movement, and the MDC was contested terrain. This is not the case with the anti-Zuma campaign, which is entirely submerged under big neoliberal white capital, whilst organized labour has stayed away. Participation of the left merely gives legitimacy to a campaign whose essential objective is to defend the status quo of the Apartheid neoliberal economy and co-opt and roll back the rising revolts. The focus must be regroupement of the small, fragmented left groups, and the hundreds of thousands of cadres in radical unions and youths, into an ideologically, organizationally and politically independent united front of the left. The launch of a radical labour federation, the South African Federation of Trade Unions (SAFTU) provides a huge impetus. Especially with the growing exposure of the SACP leaders. In December 2016, the SACP called for unity against ‘the imperialist supported regime change agenda of the Zuma Must Fall agenda.’ Barely four months later the SACP supported the same marches, likely in defense of their fat ministerial salaries, which they felt threatened after the firing of Gordhan. Analyzing Mugabe’s landslide victory in 2013, former South African President. Thabo Mbeki argued that after Mugabe had, in the face of the Southern African Development Corporation (SADC) and western resistance, delivered land to 300000 peasants, quite simply the MDC couldn’t win the rural vote, 70% of the voters: ‘they couldn’t …because they were identified by that rural population to have opposed land reform.’ MDC had dismissed Mugabe’s land reform as fake. In the coming 2018 elections in Zimbabwe, after the most successful agricultural season since 2000 and with thousands of artisanal miners gold panning in previous no-go white farms plus thousands of people given stands in the towns, together with a still regimented and intimidated rural populace from the 2008 horrors, the MDC and its leader Morgan Tsvangirai, whether alone or in grand coalition with the other neoliberal opposition, face certain annihilation. Even a fractured ZANU-PF, whether under a doddering 94 years old Mugabe or whoever is his heir, will likely emerge a landslide winner. Similarly, if the working class and left in South Africa join the regime change agenda and Zuma delivers on radical economic transformation, the poor will not forget who stood for them and who betrayed them. It will allow Zuma, like Mugabe with the MDC, to outflank them on the left, and create the basis for the long-term renewal of the bourgeois anti-poor ANC and set back by decades the building of a radical, socialist agenda in South Africa. It is equally dangerous to underestimate how far Zuma and the black capitalists may go, as the NUMSA statement seems to, dismissing them as con-men ‘fighting for their own personal radical economic transformation’ and that of their families and friends. The deepening crisis of capitalism is radicalizing sections of the beleaguered black capitalists, which desperately need state tenders and protection for survival. Cornered, this class is being pushed to play its last card – abandon its previous role as defenders for the neoliberal economy moving swiftly to economic nationalism. Their objectives are not just personal. One objective is to wring concessions from frightened white capital. As well as win back their historical leadership of the black masses, ahead of both the ANC 2017 presidential elections and the 2019 national general elections. The 2016 local authority elections were a wake-up call just as Mugabe’s defeat in the February 2000 referendum, made him take a radical shift to the left. With their backs to the wall, especially Zuma who faces possible jail time if he loses, the black capitalists, supported by the Gupta family [wealthy South African businessmen who had banked-rolled Zuma in exchange government tenders and contracts], may go far. They have shown serious intent by breaking the unwritten rule of 1994, that the Finance Ministry/Reserve Bank are controlled by a person approved by big capital. Zuma fired big capital’s man at the Finance Ministry in April this year, and is threatening to open the doors of the dining room to the hungry, black hordes outside. The leadership of the ANC have looked down and scorned on the junk down-grades by the global rating agencies. Internally they have dared the neoliberal wing to fight an open civil war, heckling its leaders at the Chris Hani rally. Desperate, they sense radical economic transformation as their only hope of survival, learning not only from Mugabe but they have been emboldened by renewed economic nationalism in the west. Bolstered with the resources of the Guptas’ and ideologically radical left Africanists led by Andile Mngxitama, they are feeling confident. Without serious concessions to the working class, the black nationalists will not survive the unfolding tsunami from big white capital, imperialism and the pro-Ramaphosa wing of the COSATU labour bureaucracy Preventing Zuma from addressing the COSATU May Day rally after booing from the crowd foretells this. Ironically it is Thabo Mbeki, ousted from power by Zuma who is the philosophical father of the turn to radical economic transformation by the black nationalists of South Africa, as reflected in his seminal lecture on Zimbabwe. The junk down-grades, the mini-run on the Rand and the unprecedented demonstrations in Cape Town, Tshwane, Johannesburg, and the splits in the ANC Alliance show that big white capital is taking the threat of radical black nationalism seriously. It had long seen this coming. It would be a mistake to dismiss the threatened radical economic transformation by Zuma as a mere con trick. Instead the central strategy must be to put Zuma to the test through mass united demonstrations and strikes in support of the demands put forward by NUMSA and COSATU, adding a strong anti-xenophobic stance to unite the multi-national South African working class. Key is a massive campaign for the state to drop Ramaphosa’s R3500 minimum wage for a minimum equivalent to a living wage. Other important campaigns being for an increase of social grants; free university education; expropriation of land without compensation, with a mass house building project from funds taken from the big banks. Zuma and the black capitalists must not be trusted. If they refuse or fail to deliver, they must be exposed to the masses as fakes and liars and put to the cross, but by a working-class sword. On their own the black capitalists are incapable of real radical economic transformation. The key reason why the Zimbabwe land reform went so far, eventually taking 13 of 15 million hectares of white land, when Mugabe had initially aimed for only 5 million, is that there was a class of radicalizing peasants led by war veterans pushing for the redistribution. But when it came to indigenization of the banks, mines, and factories, there was no such radical class, as the working class had been co-opted, or simply ‘declassed’ by deindustrialization. Not surprisingly, Mugabe faltered, and indigenization was frozen, and after 2013 agreed to a new Constitution which has the most conservative provisions on the protection of private property in the region. Big capital now seeks to turn the 30,000 new black capitalist farmers into capitalism’s long-term bedrock in Zimbabwe. Today the dominant faction in ZANU-PF and the state is an IMF- British supported neo-liberal cabal around Vice-President Mnangagwa, Finance Minister Chinamasa and the generals. Presently there is no similar anchor for the Zuma programme, other than the black capitalists. But as Zimbabwe shows, the national bourgeoisie are not a reliable fighter against big capital. They are petty, individualistic, notoriously timorous, inconsistent, and half-hearted. As a component of capitalism they will compromise and back down before big capital, once political survival is assured. Ultimately their fear of the potential of the working classes revolt is much greater than their fear of their rival capitalist bed-mates, big white capital. It will thus ultimately seek accommodation rather than the overthrow of capitalism. For now, South Africa is not yet at the decisive Zimbabwe moment of 2000. Rather it is similar to November 1997 when Mugabe conceded to the demand for pensions and land by war veterans and designated over 1400 white farms for acquisition. Big capital’s warning shot was a run on the Zimbabwe dollar, 72% of whose value was wiped off on Black Friday. Mugabe held back and only decisively moved after February 2000, after losing the referendum. South Africa is at cross-roads and can go either way. Either Zuma and the black capitalists are frightened into a retreat by the robust response of big capital, the middle-class demonstrations and the ANC right-wing, or they radicalize. Whether Zuma will indeed proceed to appropriate Malema and the EFF’s radical rhetoric as he threatened to when calling on the ANC MPs to back the motion for expropriation of land without compensation. Whether Malusi Gigaba, the new finance minister, will be what Mugabe called “amadhoda sibili” (a real man) remains to be seen. What will be critical is the working class and if it moves to take advantage of the space opened-up by Zuma’s opportunistic call for radical economic transformation. Independent mass actions in the workplace, communities and rural areas must be accelerated. Unlike Zimbabwe, peasants in South Africa are only 35%, meaning it is only the working class that can provide a sustained basis for the above radical action. Without such mass action from the working class, Zuma and the black capitalists will likely try and give as little as possible, and minimize the backlash from big white capital and imperialism. Their fundamental objective is to buy breathing space, and political survival and not a full scale radical transformation programme that could either go beyond their control or provoke an offensive of capital and imperialism. The fundamental contradiction of capitalism today remains the advanced and globalised productive forces and relations of production imprisoned in private ownership and the nation-state for private gain and profit instead of human need. This is shown in the obscene fact that nine male capitalists own more wealth than half of the world, or 3.5 billion people! This contradiction can only be resolved by the socialization of the means of production at the global level under the democratic control of the main producing class, the working class – that is what we understand by socialism. A process that was pioneered a hundred years ago by the workers and peasants of Russia. Today we must continue in the path they pioneered. To succeed the fundamental lesson from the Bolsheviks, the party who led the 1917 Russian revolution, is the urgent need to build mass socialist parties to spearhead the struggles of the working classes and the poor. Today it is the turn of the South African working class to pick-up the baton! They have much to learn from the failures of the popular and working class struggles in Zimbabwe. Munyaradzi Gwisai, a former Movement for Democratic Change (MDC) parliamentarian, is a law lecturer at the University of Zimbabwe and coordinator of the International Socialist Organisation of Zimbabwe. Oxfam International, 2017 Report, “An economy for the 99 percent: it’s time to build a human economy that benefits everyone, not just the privileged few”, www.oxfam.org. Mbeki T, “Mbeki on Zim polls, land reform”, New Zimbabwe. Com, Aug 2013, www.newzimbabwe.com/news/printVersion. Moyo S”, Three decades of agrarian reform in Zimbabwe,” Journal of Peasant Studies, Vol. 38, No. 3, July 2011, 491. Gwisai M, “Revolutionaries, resistance and crisis in Zimbabwe” in L. Zeilig, (ed) Class Struggle and Resistance in Africa, (Haymarket Books, Chicago, 2009) 219.